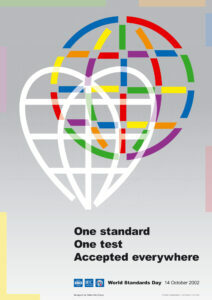 Standards and tests go hand in hand and are key to the development of the global market. Standards give specifications or requirements for products, services, systems, processes and materials. Tests then verify that these standards can be met reliably over time. Once these standards are accepted broadly at an international level, they can further foster the development of a global market for the goods or services – a market built on consistent quality and consumer confidence. Standards are a technical language that businesses the world over use to create goods, services and systems. Since businesses everywhere understand it, the goods and services they produce based on this language should have the same quality wherever they are made. Standards may come about to achieve a variety of objectives such as ensuring safety and performance, but their basic and essential nature is that, by establishing certain parameters, they provide a common technological foundation for producing goods, services and systems anywhere. In parallel, a common confidence-building foundation for exchanging these goods and services between buyers and sellers in the global market comes from using internationally agreed standards and tests together to verify that the requirements of these standards are being met. The technical term for this foundation is “conformity assessment”. A concrete example is when a testing laboratory assesses whether or not a product or a service conforms to a specified standard. Participants in a free market rely on confidence to ensure a fair exchange of goods and services and the essential aspect of conformity assessment is that it helps to ensure this confidence because it is a valid means to verify claims about quality, performance, and other parameters. For international standards to make a maximum contribution to achieving the objective of facilitating trade, it is important that all countries participate in developing and adopting them. The three leading organizations that develop and disseminate standards and recommendations for the global market are the International Electrotechnical Commission (IEC), the International Organization for Standardization (ISO) and the International Telecommunication Union (ITU). The inclusive nature of the three standards organizations helps to achieve the objective of truly global trade. In addition, several conformity assessment schemes exist for organizing the testing of products to standards. The combination of standards and conformity assessment serve the market by helping to lower technical barriers to trade – which results in lower manufacturing costs – and to raise the level of confidence between buyers and sellers. Relevant international conformity assessment mechanisms, standards, guides and recommendations could also help to underpin Mutual Recognition Agreements at different levels. The IEC, ISO and the ITU encourage the development of standards through a continual dialogue with industry and government. In this way the development of single standards and tests can reflect the diversity of opinion in the global market, and encourage market development without stifling innovation. With such a system, buyers and sellers may be able to agree more easily on the value inherent in the products and services for sale in the market. By helping to make any one part of the global trading system more efficient, the three organizations can help to make the entire market that much more efficient. Ultimately, an efficient market benefits everyone: manufacturers, consumers, governments, testing laboratories, and all other participants in the market.